Tuesday and Wednesday nights are usually my worst eating nights, because I don't get home from teaching until 9 pm. My enthusiasm for cooking at that hour (and after teaching 2 classes) is pretty minimal. We often end up getting take out. This week however, I did manage to triumph with some homemade cooking - albeit quite simple fare. Last night, we had some spaghetti with homemade tomato sauce. My super cool friend Jane is a farmer who grows the most stunning organic tomatoes. They are unlike any other tomatoes in the world! Last year she gave us a jar of cooked up tomatoes and they were SO good that this year we bought a bunch of jars to last us into the winter. So, I broke one open and made some super, super delicious and simple tomato sauce with basil, garlic, salt, and a touch of olive oil. Yum! 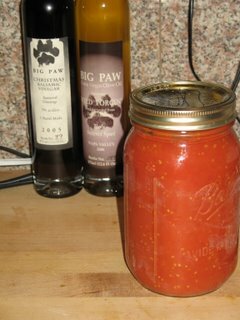 Here's one jar of the tomatoes. Also, in the background you can see two recent gifts from my friend Jenna. Big Paw brand Balsamic Vinegar and Porcini Olive Oil. I was never a fan of vinegar until I tried the stuff Big Paw makes. IT IS INSANE! So good! Look for those goodies to make an appearance in upcoming recipes. 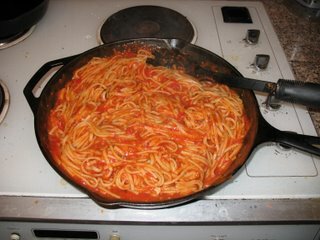 Here are the noodles are mixed up in the sauce. Tonight, we made burritos! Simple, tasty, and quick. I bought some big, yummy tortillas by "Indian Life" brand at our health food store to make our burritos extra special. For the refries, I just dump out a can of low-sodium refries, add about 1 T of cumin, and about 1/2 - 3/4 c. of salsa, and cook up until warm. Then we put salsa, lettuce, tomato (from our garden! ), hemp seeds, and avocado on. yum yum yum. 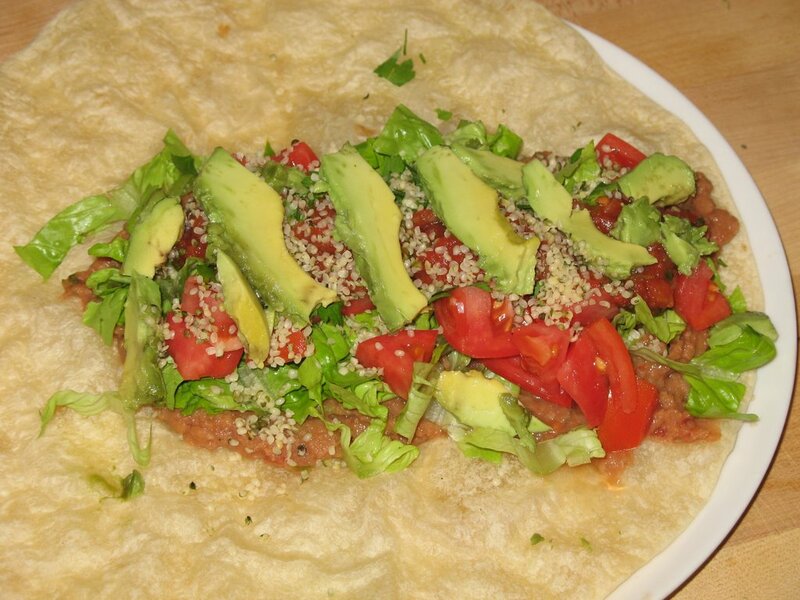 Oh, I like the idea of adding hemp seeds to the burrito! Yeah, I am always looking for places to throw in some hemp seeds. I also prefer not to eat late at night, but I guess this is the plight of the yoga teacher. Often I start teaching around 4:30 or so, so there isn't time to eat earlier. I just usually end up staying awake a bit later on my late teaching nights... so that I can eat and digest and generally unwind. I love balsamic vinegar, and bet Big Paw will be great if it won you over! Love the burritos! I put hemp seeds on so many things now. They look great here with the avocado and garden tomatoes. yum! Looks fantastic. THIS is what fast food can be. These are tow of my "I don't feel like cooking" stand-bys, as well. Mmmm- seeing your burrito actually made me go out and buy a couple of avocados- you reminded me that I hadn't had them in a while- thank you. I have hemp seeds too, but they're roasted and salted, so just good for snacking. I wonder if they lose some nutrition by being roasted...? By the way, I'd never heard of the magazine you mentioned, but I'll be sure to check it out! I just learned that the Big Paw vinegars are available online too! So if you ever want to splurge and get yourself a fancy vinegar present, you'll know where to start looking! It's true about "fast food"... Maybe I should make a little list and keep it on the fridge: good fast food ideas. Then, when I am tired and my brain hardly works, I can see the list and remember! Yes, the avocado was very good! I hardly ever buy them, because they are so fatty, and because my boyfriend dislikes them. Only me and our dog Stevie Wonder enjoy them. It was a nice treat. I gave Stevie the left over avocado!